This article analyses the practices of deportation and transportation of colonial subjects from Libya, Italy’s former possession, to the metropole throughout the entire colonial period (1911–1943). For the most part, the other colonial powers did not transport colonial subjects to Europe. Analysing the history of the punitive relocations of Libyans, this article addresses the ways in which the Italian case may be considered peculiar. It highlights the overlapping of the penal system and military practices and emphasizes the difficult dialogue between “centre” and “periphery” concerning security issues inside the colony. Finally, it focuses on the experience of the Libyans in Italy and shows how the presence there of colonial subjects in some respects overturned the “colonial situation”, undermining the relationship of power between Italians and North Africans. The article appears to be available open-access. The latest issue of Quaderni di archeologia della Libya (#21)—one of the three academic journals which cover archaeological-related topics in Libya—is out. It hadn’t appeared since 2003, due no doubt to the complications of carrying out work in Libya during the regime and afterwards. But at the price of €230 for a hard copy or €184 for an ebook, and without online subscription options, it’s basically unobtainable. At least the table of contents of the latest issue can be viewed here. Michael R. Ebner, “Fascist Violence and the ‘Ethnic Reconstruction’ of Cyrenaica (Libya), 1922–1934” in Violence, Colonialism and Empire in the Modern World, eds. Dwyer, Philip, Nettelbeck, Amanda, pp. 197-218 (Palgrave, 2017). Shiferaw Bekele, Uoldelul Chelati Dirar, Volterra, A., & Zaccaria, M. (Eds. 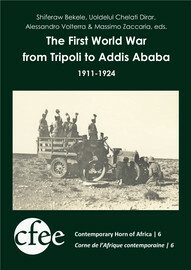 ), The First World War from Tripoli to Addis Ababa (1911-1924). Addis Abbaba: Centre français des études éthiopiennes, 2018.